You’ve most likely seen color-coded, real-time AIRNOW maps of air quality on the web or on television that show whether the air is safe, unhealthy, or hazardous. 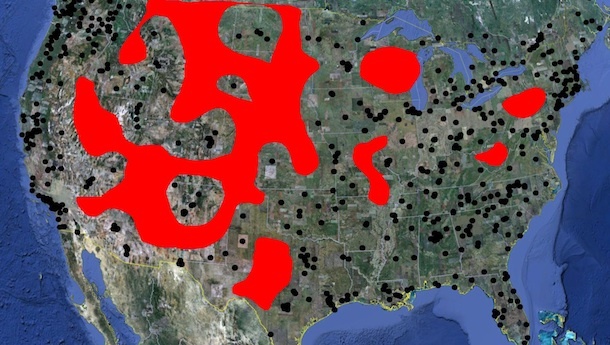 What you may not realize is that the network of ground-based instruments the EPA uses to make those maps has large gaps in some parts of the country, particularly in sparsely populated areas of the Great Plains and Intermountain West. (Red in the map above indicates areas without ground monitoring stations; black dots show the locations of stations). To address this problem, an effort sparked by recent advances in satellite measurements of air pollution seeks to integrate NASA and NOAA satellite measurements into the AIRNOW system. 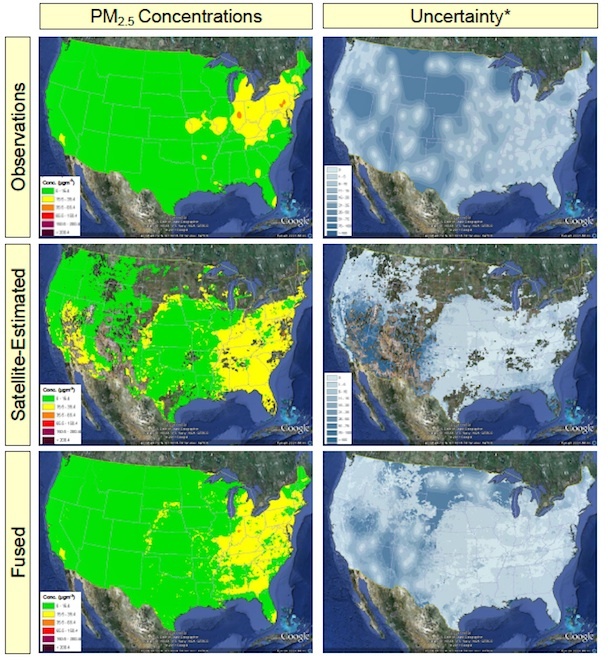 The accuracy of satellite measurements of air quality can vary depending on the weather, the topography, the brightness of the underlying surface and other factors, so the researchers leading the effort are developing a method that selectively incorporates only the reliable satellite data. The researchers are still refining the technique and the system isn’t yet operational, but preliminary case studies suggest the technique will be up and running by 2013. The figure above shows the technique researchers are developing tofuse ground observation and satellite observations of the small particles (PM2.5) that causes health problems. Groundobservations have high uncertainties (shown in the darkest blue) indifferent areas than the satellite observations. The right combinationof the two – see the fused maps at the bottom of the figure – will be more accurate than either the ground network or satellite measurements alone. Text by Adam Voiland. AdamPasch of Sonoma Technology presented a poster about this topic at theAmerican Geophysical Union fall meeting in San Francisco on Dec. 5, 2011. Video producedby Sonoma Technology. Imagery courtesy of Adam Pasch.